We passed it Saturday as we drove into St. John's. "What was THAT?" Then, again on Sunday, there it was again. "HUH?" I read the article. 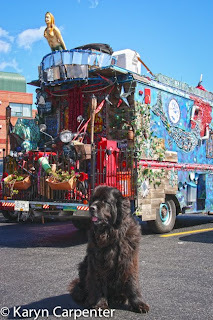 I had to meet the woman who owned this retired Canadian Post truck turned Gypsy Caravan. She needed a change of lifestyle and to see the world and she wasn't waiting until she had hit normal retirement age to do it. 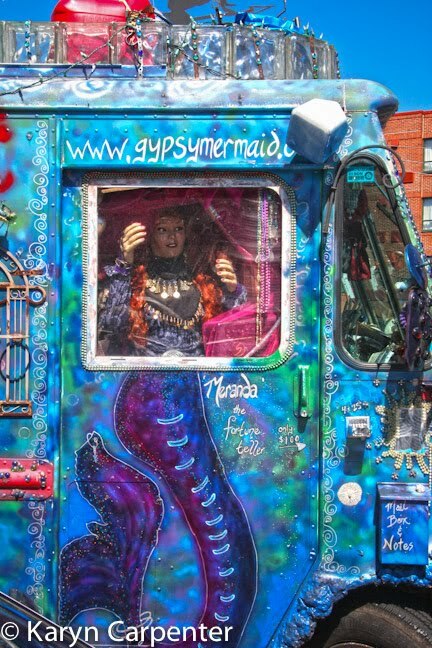 Michelle Kaiser, known as the Gypsy Mermaid, decorated her van with flowers, fork and spoon art, paintings, eyelashes over the headlights, a mailbox, and a mechanical fortune teller who will spit out your fortune for a buck. 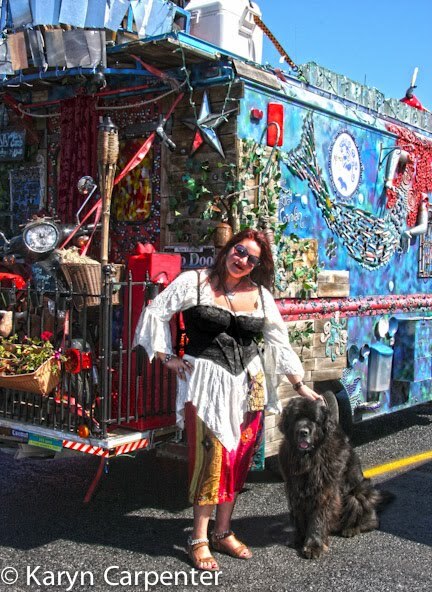 She's got this Gypsy gig down to a true art-form! I'm in awe! She set out from Nanaimo Canada a year ago and has been touring the US and Canada with no apparent interest in settling down to a 9 - 5 job sitting behind a desk somewhere. You GO girl! Arayo and I had to meet her so we looked her up on Facebook and sent her a message. Driving into St. Johns a couple hours later we spotted her van in a parking lot. (It is kind of hard to miss.) As luck would have it, the one empty spot was right next to her and we pulled in, got Arayo out of the car and walked around, admiring her creation. 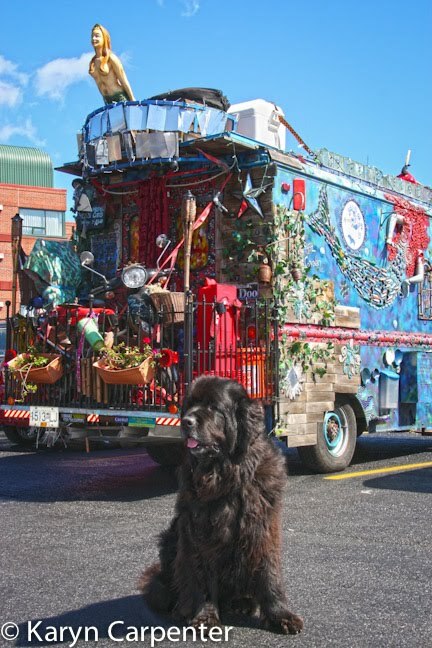 I set Arayo up for a few photos when Michelle walked up and agreed to pose with the Gypsy Newfoundland Dog before heading out. She'd had an offer. Someone wanted to teach the mermaid to scuba dive. She wasn't excited about breathing through a tube but was off to check it out anyway - game for whatever life was going to offer up next. Hopefully we'll see you on the road again soon, Miz Mermaid! I'm in Oswego with your mom. We drove over to Pittsburg together this morning and caught up on things (politics included). I have not been following your blog so when we returned today I had Janet show me your blog. Great stories! Great photos! Will you be traveling indefinitely? Will you be decorating your car too . . . I like the eyelashes over the headlights idea. Anyway, take care and you'll have one more regular reader as your adventure continues. So, where are the pictures of Jacky, Bob, and all the Newfs gathered around the table? I've really been enjoying all your blog entries and the wonderful photos, but I'd like to see pictures of some of the Newf people from that part of the world that I've gotten "to know" on Newf-l or Newf-tech. Keep safe when Earl passes by. It's been downgraded again, but even then fierce winds and rains can cause lots of damage. I want to know if she makes up those fortunes herself or writes down what she hears another power dictate and then loads the fortune teller, or if there is a store where one can buy fortunes for the machine. That's a job I could do- write fortunes! Did she give you any other hints about how she pays for her lifestyle? I can't imagine her rig gets great MPG. It was great meeting the both of you! I read Mermaid Oracle Cards, there is a pair of ruby red lips on the driver's side that accepts gas $ donations, Meranda my mechanical fortune teller tells amazingly accurate fortunes for a buck, (yes I created her, and her voice), and on weather permitting occasions I sing on my back stage... so no it is not a money making gig whatsoever.. literally a hand to mouth to gas tank situation.. but it sure is fun sharing smiles and giggles on the way with everyone.. and it is true the Gypsy Caravan is terrible on gas.. she gets about 3 - 9 mpg.. on good days! Scuba lesson was great fun.. you can follow my adventures on facebook.. 'gypsy mermaid' over 500 videos and a bajillion photos now.. happy trails everyone!